Criterion's reissue of The Red Shoes, Michael Powell and Emeric Pressburger's enchanting 1948 fairy tale, is due to be released in July. It's going to sport the newly restored print of the film that we've been hearing about for quite some time now. Spearheaded by Red Shoes-fanatic Martin Scorsese with the UCLA Film Archive, the movie was given a frame by frame scrubbing and has been one of the most hotly talked-about revivals since the new version premiered last year. A few places around the world have been lucky enough to host this spruced-up Red Shoes theatrically, and as of May 21, you can count Portland, Oregon, among them. I wrote a bit about Cinema 21 in my review of Ran last month. The stalwart little theatre is a Portland landmark. I've been seeing movies there since I moved to town in 1994. Cinema 21 hosts first-run indies and art house, as well as being the main stop for revival pictures. It's because of Cinema 21 that I saw many a classic movie for the first time. One of the most mind-blowing experiences I had there was catching Powell and Pressburger's A Matter of Life and Death in the mid '90s. It was my first film from the Archers (as they are collectively known), and I was not at all prepared for the marvelous imagination this movie had to offer. At the time, it was not available on VHS and as DVD fans know, it took forever to get a digital release, so it was many years before I would ever see it again. The original 1999 DVD cover. The press screening for The Red Shoes was not my first experience with this particular film, but it might as well have been. The restored transfer is everything they claim it to be, making it seem like a whole other film. 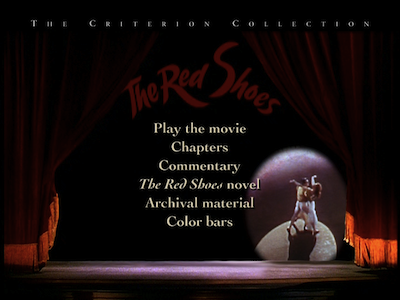 The Red Shoes looks newly minted, as if it was struck from a fresh batch of Technicolor cooked up in a lab just yesterday. The image is flawless, and the color is so vivid, it's practically a living entity. The range of pigments and the level of detail is simply astonishing. Moira Shearer's red hair looks like a swath of velvet wrapped around a tiny flame, and how did I not know before that she has freckles on her collarbone? I feel like I am finally getting to see what previously only cinematographer Jack Cardiff saw, that I have been ushered through a door into his mind's eye to bathe in everything he imagined. 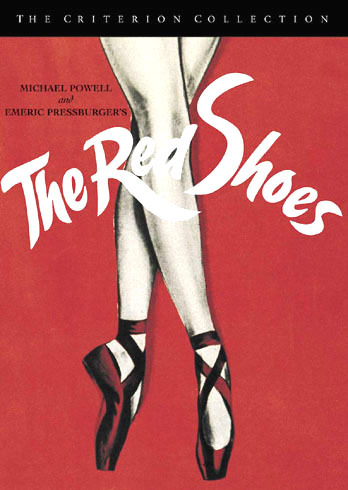 For those unfamiliar, The Red Shoes is the story of an international ballet company run with an iron artistic hand by the headstrong and demanding Boris Lermontov (Anton Walbrook). On a stop in London, he meets a young dancer named Victoria Page (Shearer) whose spirit and pluck earn her a spot in his Corps. The talent seeker also hires a college-age composer named Julian Craster (Marius Goring) to be a deputy conductor after the prodigy storms into his office claiming Lermontov's latest ballet plagiarized his work. Once under Lermontov's wing, the two neophytes soon find their expression encouraged. He assigns Julian to write the score of a ballet based on Hans Christian Andersen's The Red Shoes, and Victoria will play the girl who wanted so badly to dance, she wore a pair of magic slippers that cursed her to keep dancing until she died. 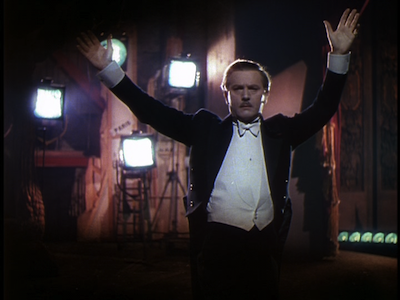 Midway through the film, the ballet is performed in full. It's the movie's most famous scene. Three years before Gene Kelly and Stanley Donen ended An American in Paris [review] with an original ballet, the Archers dropped a complete dance into the center of their backstage romance picture. It was choreographed by Robert Helpmann with music by the Royal Philharmonic, and it features world-famous dancer Leonide Massine backing up first-time movie actress Shearer, then a member of the Sadler's Wells Ballet. There were apparently 53 dancers in total, and the fifteen-minute sequence took six weeks to film. The staging wasn't a direct "shoot a live performance" set-up, the approach was more like a fantasy sequence set inside the performance. Swathed in paintings by Hein Heckroth, the production vibes toward the surreal, with special effects bringing stage conventions to life. When Julian is instructing Victoria on how to hear his music, he suggests she imagine the things that are happening in the story and make it a transformative experience. What Powell and Pressburger show us is what Victoria has imagined and by doing so they transform their film into something magical. This ballet is no mere trifle, however. It is not a show-off exercise dropped into the center of the melodrama just for the sake of it. 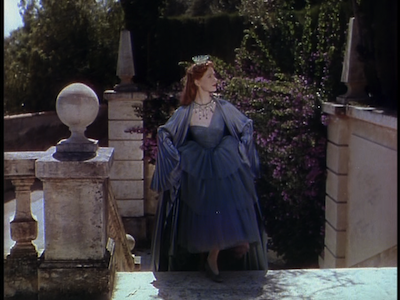 The story that Powell and Pressburger craft runs parallel to the themes of the dance. The push and pull between the triangle of Lermontov, Victoria, and Julian is represented in the Andersen adaptation. Lermontov is the shoemaker insisting that his ballerina perform, Julian is the lover who tries to pull her off the stage, and Victoria is the girl caught up in her dreams and desires and having no clear idea how to get out. 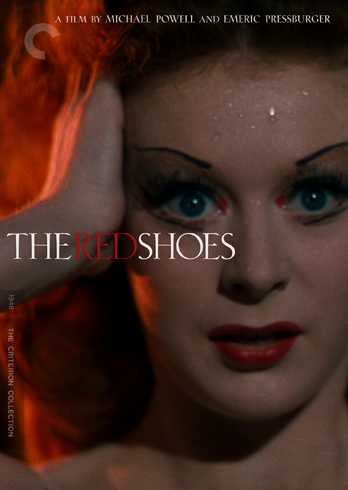 The Red Shoes is about the passion of creation, the urges that compel artists to make art. What must one sacrifice to fulfill their dreams? Must art be all? It can be a joyful experience--the backstage material showing the collaboration and camaraderie of the company is some of the best stuff in the movie--but it can also be hard work that requires severe tunnel vision to get through. The 2010 theatrical reissue poster. It's funny how years and multiple viewings can change one's perception, though. Boris Lermontov is generally considered the villain in the love triangle. He's the one who, in the fairy tale, would curse the girl to dance and never stop. 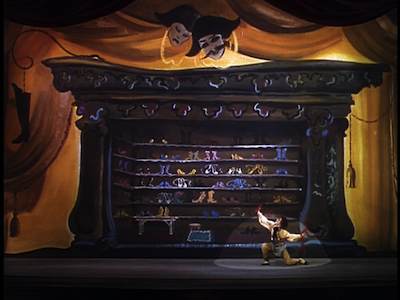 (In the original story, they have to lop off her feet with an axe to disconnect her from the shoes; in the ballet and the movie that hosts it, Victoria's ending is still dire, though not as gory or gruesome.) Most fairy tales are fairly straightforward in their morality, and again, even here, the characters practically fall into stereotype. Or so a fairly surface reading of The Red Shoes might have you believe. Maybe it's my more advanced age, maybe it's the fact that I've worked in a creative industry for a while now, but I found Boris Lermontov to be a far more sympathetic character than Julian Craster this time around. As things heat up within the love triangle, Boris asks Victoria if she would ever ask Julian to give up his métier, if she would ever want him to abandon music for her. When she says no, she would not, Boris then asks why she would permit Julian to ask it of her. It's a crucial question, and one that reflects badly on the young Romeo. His motivations are selfish. He wants her to be with him and no one else, to do nothing except inspire his melodies. Lermontov, sure, wants Victoria to be his and to dance at his company, but that does not require her to sacrifice who she is--nor would he ever want her to. What she means to him is entirely rooted in the talent that powers her. He knows to give up on her gifts would be to give up who she is, and then she would not be the woman he cares about. Read more about Cinema 21 in this excellent article by Shawn Levy. Please note: The screen grabs here are from the original Criterion release; see screen comparisons with the 2010 disc here.